Inventorum Natura (IN from now on) is a strange and wonderful book. It is a coffee-table book with ancient pseudoinformation that has in turn been treated as genuine. Half of it is in Latin. It translates an ancient document that never existed. It has a tri-triceratops kraken. Confused? Read on. You can purchase the book from here and here. IN falls firmly on the “Pretty Pictures” axis of Bestiary Classification. Purportedly a translation of a lost manuscript by Pliny the Elder, it covers the animals, plants, cultures, and places encountered by the Roman historian. 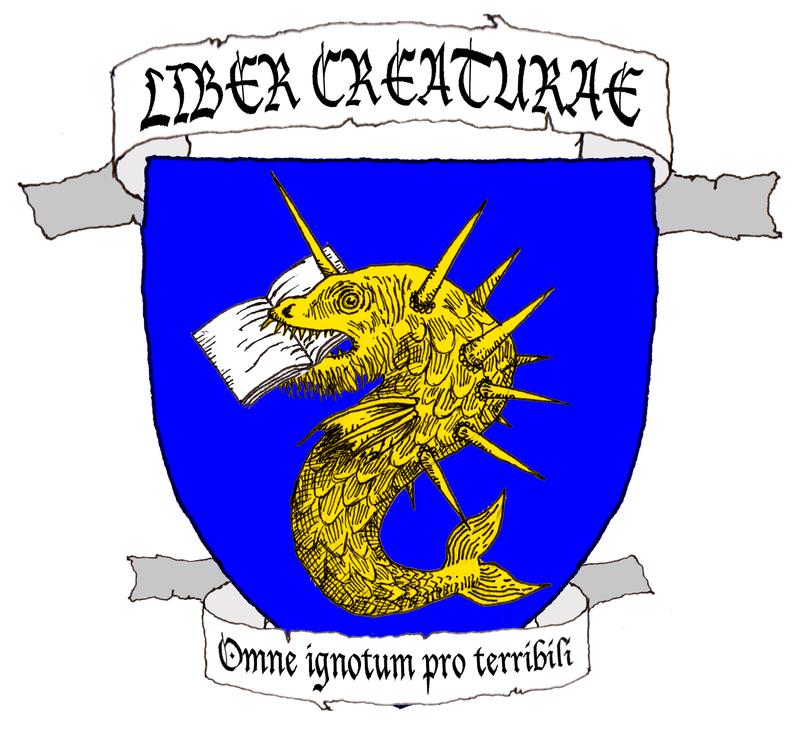 It is not a comprehensive creature encyclopedia, but provides a broad selection of creatures from across the world, including an economical description of horse-unicorns and rhino-unicorns within the same page. The text follows Pliny’s travels around the world. As such it’s narrative and not clearly divided, but can be roughly separated by region, such as Africa, India, China, and Hyperborea. If you’re looking for something in particular, there is a table of contents. Readable both in Latin and English, the text is a joy to read through, especially for Latin scholars brushing up on their skills. This is where I need to issue a disclaimer. The text of IN is entirely fictitious and written by the author. Pliny never visited China, or sailed to Hyperborea, or encountered krakens. This may seem obvious, but the text is written and treated as though it were a genuine never-before-seen discovery being revealed for the first time, and kayfabe is maintained all through the book. To avoid repeating myself, I’ll address further issues under the “research” heading. All of the journal entries are illustrated by at least one gorgeous full-page color painting. Una Woodruff is a talented artist who excels at painting plants, and it really shows – a lot of the most memorable creatures in the book are plants. The animals on the other hand have a strange not-quite-realness to them, a sort of uncanny valley that makes them even weirder. In fact, even if you don’t read Latin, and even if you don’t want another reference for your bestiary bibliography (bibestliography? ), the art alone makes it worthwhile for teratologists of all stripes. Besides this is the only book I know of that gives the kraken three triceratopsian heads. Here’s where my main beef with IN comes in. There are no references whatsoever, but it owes a lot to Borges’ Book of Imaginary Beings. In fact, I’d argue that more creatures are from IN than are from anything Pliny wrote! It’s great for an entertaining read, but anyone looking for scholarly research should look elsewhere. A beautiful book, written and illustrated so skillfully that it has fooled a nonzero amount of people. I like the book, and I love the art, but its scholarship problems give me pause. 3/5 if you’re like me and get irrationally annoyed by teratological embellishment, 4/5 if you don’t mind.